Melee weapons, although not the most heavily advertised pieces of Nerf equipment, are useful for close combat situations during Nerf wars, especially when you’ve run out of ammo to eliminate your foes with! Some of the least discussed and least produced pieces of melee weaponry made by Nerf are axes. However, that does not mean that the axes Nerf does have are poorly made or poorly functioning. In fact, there are currently some amazing Nerf axes on the market right now! 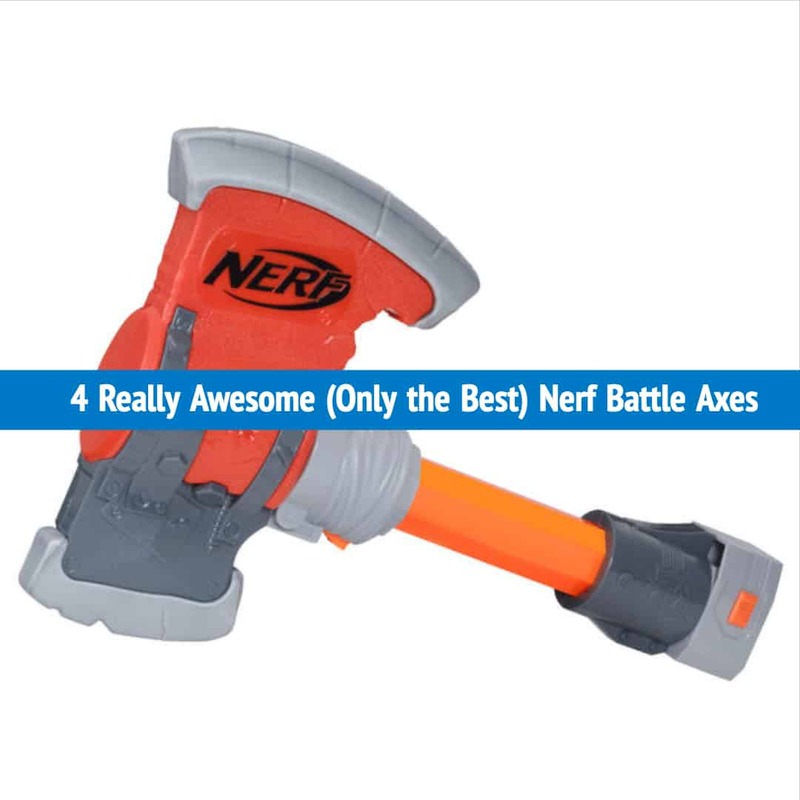 If you’ve been looking to add a Nerf axe to your collection but don’t know which one to choose, here are 4 really awesome Nerf battle axes that you need to take a look at! Now that we’ve covered some of the best axes that Nerf has to offer, let’s talk about some of the things that you should be looking for when you are shopping for your own Nerf axe. The biggest quality that you should be looking for in a Nerf axe is durability. Although this isn’t too big of an issue with Nerf, there are some Nerf weapons that are made with a much lighter foam. This makes them susceptible to breaking within a very short period. You can generally tell when a Nerf weapon has foam that is too light because it bends easily and does not bounce into place once it has bent. This will definitely cause issues in the future if the foam either breaks off or shreds when used in battle. A durable foam will stay in place and maintain its shape. The second quality that you should be looking for in a Nerf battle axe is toughness or hardness. Depending on your age and what type of Nerf battles you engage in, the toughness and the hardness matters quite a bit. If the Nerf battle axe is for a small child, you want to make sure that the axe of your choosing is hard enough to ensure that it doesn’t break during battle but soft enough so that it doesn’t cause any real damage if a child uses it against another child. If you are older or if the person you are purchasing a Nerf axe for is older and doesn’t mind harder hits with a tougher weapon, you can choose an axe that is built with stronger material. The last thing that you will probably want to consider when looking for a Nerf axe is price. Surprisingly enough, Nerf axes do cost more than the lower-end and even average blasters. However, the smaller axes are cheaper than the larger axes and are also easier to get a hold of. If you’re looking for a more affordable option, you will most likely be better off purchasing a smaller Nerf axe. If you have money to spend and you think you get more out of a larger axe than a smaller one, then your money would probably be best spent on one of the larger axes that Nerf has to offer. The most important thing you can do when shopping around, however, is to make sure that you do your research first. Every Nerf product has its advantages and disadvantages and you should always evaluate each product before you make a purchase. Nerf axes make great weapons for any type of Nerf battle and this list of the top four awesome Nerf battle axes will help you start finding one of your own. Need help learning more about Nerf battle axes or trying to find something that didn’t make the list? Here are a few videos covering some of the axes that Nerf has available. The Nerf N-Force Battlemaster Mace Axe is a great option for those who want a longer melee weapon to defend against oncoming attacks. 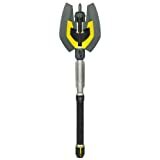 The Nerf N-Force Battlemaster Mace Axe is much more attractive than the Nerf N-Force Warlock Axe and features a slim black and metallic gray body with a smaller, double-sided axe head at the top. Like the previous axe, this one has a yellow center and gray edges. However, this axe head is sleeker and more aesthetically pleasing. This axe also has a medieval style although many websites refer to this axe having more of a gothic style rather than a medieval style. This axe is also around two-and-a-half-feet in length and weighs around a quarter of a pound. It’s made of a very light, durable foam so you will not have to worry about it breaking or hurting other people while you are on the battlefield. The only downside that you might find with this weapon is its lack of grip. The majority of the other Nerf melee weapons have a ridged grip handle while this one is made more with design in mind rather than use. Still, the Nerf N-Force Battlemaster Mace Axe is a formidable weapon in any Nerf war and will make you look like the coolest player on the battlefield as well! While the first item presented on this list were much larger, these next two options are going to be smaller and are perfect for those who like close combat with their friends during Nerf wars. The Nerf Zombie Strike Wrench Axe is known for its unique look and ease of use on the battlefield. 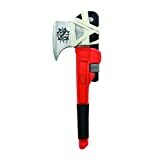 Designed especially for the Zombie Strike series, the Nerf Zombie Strike Wrench Axe is a large red foam wrench with a handle designed to look as though it was wrapped with rope and a small axe head that has been attached to the wrench using a piece of cloth. This axe is extremely light and measures about a foot-and-a-half feet in length. This one is perfect for close combat and is light enough that you won’t cause any damage to your opponents. Additionally, this is a perfect long range weapon if you are accurate with your throws and have run out of ammo during a Nerf battle. 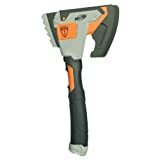 If you’re looking for something with style that you can carry around the battlegrounds with ease, look no farther than the Nerf Zombie Strike Wrench Axe. Another lightweight axe option, The Nerf N-Force Klaw Hatchet is a great way to strike down your enemies without having to lug around a large melee weapon. This axe is also about a foot-and-a-half in length and weighs less than a pound, making it easy to carry around and use in combat. The foam is light and durable and can be made for close combat as well as for throwing at enemies. Although it is advertised with the word “hatchet”, don’t let it fool you. This small axe packs quite the punch and is great for anyone in need of a light weapon. This type of axe is also ideal for anyone who prefers to have weapons in both hands rather than having to use a melee weapon that requires both hands to use. The Nerf N-Force Warlock Axe is a go-to for anyone who loves Nerf battles that have a mythical or medieval feel to them. Reaching a length of almost two-and-a-half-feet and weighing in at less than a pound, the Nerf N-Force Warlock Axe is a durable tool capable of blocking any and all attacks that come your way. Let’s take a look first at the overall design of the Warlock Axe. The Nerf N-Force Warlock Axe has a rather simple build with a ribbed white handle, long, skinny body, and large, double-sided axe head that has a yellow center and a metallic outer edge. Out of all the axes that Nerf offers, the Nerf N-Force Warlock Axe isn’t the most attractive option. However, that shouldn’t deter you from considering it as a possible melee weapon for your Nerf collection. The large blades of the axe head are more than enough to keep other melee weapons from striking you down and are also large enough to block oncoming bullets, if you are fast enough! The Nerf N-Force Warlock Axe is made of a light yet durable foam that is able to take quite a few hits without breaking and is able to deliver them without causing severe damage to your opponents. Overall, The Nerf N-Force Warlock Axe is a great choice for those who want something that will be flexible in all battle situations and is especially great for those who like to engage in battles that are themed. Out of these five options, we highly recommend purchasing the Battlemaster Mace Axe . It's an impressive axe, it's light and will keep any opponents at a safe distance!